Most questions about our vacation rental policies will be found in the required Guest Rental Agreement. We highly recommend that you read this agreement in its entirety. 1. What are your vacation rental policies and rates? Booking a vacation rental from Amelia Rentals and Management Services is secure and easy. You may select your vacation rental based on several criteria; by date, setting, or advanced search. Once you have found the vacation condo that suites your needs you may book it online 24/7 by pushing the “Instant Quote” button on each individual property description. You can always call or email our friendly Reservations and Guest Services staff during business hours to help you during the selection process, answer questions, or if you would just like request additional services. Refunds: A refund less 10% of the total stay will be given for a cancellation made thirty (30) days or more before the arrival date. The Damage Property Fee is non-refundable. Full payment is due at time of booking if the arrival date is within 30 days of the time of booking. No refund will be given for a cancellation within the thirty (30) days prior to the arrival date. Refunds will not be given for late arrivals or early departures, mechanical failure of items such as (but not limited to) air conditioners, TV, internet, dishwashers, pools or other luxury items. This includes power outages, construction from surrounding areas, flooding, or water shortage. 3. How and when do I pay for my reservation? You must have your reservation paid in full 30 days prior to check-in. Payments made, other than the initial 50% deposit, should be made by calling 1-800-874-8679 or 904-261-9129. We accept Visa, MasterCard, AMEX, Discover, personal checks (checks must have time to clear our bank before they are credited to your reservation). Our system automatically charges guest balance 30 days of arrival on the credit card that was used to secure reservation. 4. When will I sign the Guest Rental Agreement (GRA)? You will receive a confirmation email shortly after you book with us. This confirmation email will have a link to sign the GRA online. We recommend that you read the GRA. This will answer most questions, if you should have any additional questions you may call our office or email us any time. 5. Should I purchase travel insurance, and what does it cover? Guests may elect to purchase a travel insurance policy from a 3rd party provider, Red Sky Travel Protection Plan, before their final balance is paid. We highly recommend that guests consider this option if they feel that there is a chance that their travel plans could be interrupted for any reason. Learn more about the RedSky Travel Protection Plan on their website. Amelia Rentals & Management Services partners with Red Sky Travel Insurance to provide Sun Trip Preserver® coverage for our guests. Sun Trip Preserver provides cancellation and interruption services as well as emergency assistance and travel services. Protect yourself in the event of hurricane evacuations and family emergencies such as illness or death in the family. The travel insurance is optional and the cost is 6.95% of your total reservation stay. 6. What time can I check-in and what do I have to check out? Check-in time is 4PM and Check-out time is 10AM. Early arrival and late departure may be requested at the time of booking, before arrival or during your stay. This option is based on availability and may require additional rental payment. Hold overs will be charged on an hourly rate. Complementary early arrivals or late departures cannot be guaranteed due to cleaning time between reservations. Make note: Your check-in time is 4PM. We cannot guarantee check-in by 4PM during holidays and peak seasons. Your patience will be appreciated in these instances. 7. What are the office hours and location? 8. What if I book through VRBO or Airbnb? We use these online booking services to reach a broader audience. Once you book through one of these, you will then receive confirmations from Amelia Rentals. Please open and pay attention as there will be a rental agreement to sign and directions for check in. However, payments process through VRBO and/or Airbnb and we handle the reservation and check in process. 9. What should we bring with us? Suggested Items - You may want to bring to make your stay more enjoyable: Sunscreen (summer), Insect Repellent (summer). If a guest is staying 3 + days or has a large group we also suggest - Additional Hand Soap, Toilet Paper / Paper Towels, Extra Trash Bags, Coffee Filters, Coffee, Dish washing detergent, Laundry detergent, Family entertainment items (DVDs / CDs, Books / Board Games / Playing Cards / Puzzles). * Although some of the items listed above are available at most condos we cannot guarantee each item is available in every unit. 9. What is the cleaning fee for? Rates for cleaning vary by size of property. It is important to us that you arrive at a well-equipped condo in the best condition. 10. What is the Damage Protection Fee and how does it work? Each reservation is charged a non-refundable fee of $70.00 for a Damage Protection Waiver. This waiver is designed to protect you from charges due to accidental damage only. The DPF can provide up to $500.00 to repair accidental damages (beyond normal wear and tear). If any damages surpass $500.00, additional charges will be applied to the credit card on file and written documentation will be sent to the Guest(s) of record. If damages are determined to be caused by the willful misconduct, misuse, or pets; the Damage Protection Waiver will be voided on the grounds of intentional act(s), gross negligence, willful and wanton conduct by Guest(s) or Licensee of Guest(s), or visitor. These occurrences will result in the Guest(s) credit card on file being charged in full for any damages and management fees. The waiver does not cover any additional management fees or fines. ALL ACCIDENTAL DAMAGE MUST BE REPORTED TO AMELIA RENTALS OFFICE BEFORE GUEST DEPARTURE TO QUALIFY FOR PROTECTION. 11. If I accidentally break something am I automatically covered by the Damage Protection Fee (DPF)? No, A guest MUST REPORT any damage at the property during their stay to qualify for full coverage. If damage is discovered by our Property Care team after departure the DPF waiver can be denied. Please report any damage if it occurs. 12. Do you charge taxes on your vacation rentals? Yes! All vacation rental management companies, Lodging, and individuals are required to charge Taxes on their properties. There are two types of taxes that must be charged. 1) Lodging Tax, this is a tax that that is figured on the nightly rental rate. (Florida taxes are 7% and local taxes are 5%. 2) Sales Tax. Sales tax is charged on any mandatory service or Fee that is added to a reservation. Example: Cleaning and / or pet fee. 13. How do I get directions to the unit? You will be provided with directions to your condo when you arrive to check-in at our office. ALL DIRECTIONS ORIGINATE FROM OUR OFFICE LOCATION. 14. Do you have pet friendly units? We have pet friendly condos. If a condo allows pets it will be designated “Pet Friendly”. This option is stated on the profile and is possible with a non-refundable pet fee. 15. Are the units close to one another? 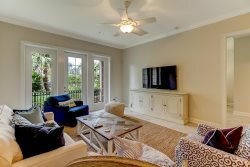 Some of our units are located in the general vicinity of other but all are privately owned and are spread throughout the Summer Beach and Omni Amelia Island Plantation. We have several groups of condos that are within walking distance to each other. You should ask our agents for additional details. 16. Are there age restrictions on renting a condo? Yes, you must be of “legal and responsible age” so we will not rent to anyone under 25 years old. The person making the reservation must be one of the guests who occupies and remains with the rental group throughout their stay. Parents, please do not call to rent for high school or college parties as guests will be asked for proof of age at the time of check-in. 17. What if we have a problem at the condo? You will be given a 24/7 after-hours help line and emergency contact number to call if you have an emergency. This number will be provided when you pick up your check-in packet or in your confirmation email. 18. Can I check-in to my condo after your office is closed? Yes, in your confirmation there are instructions - telling you how to check-in after the office is closed. The after-hours check in kiosk is locked, please remember to request instructions if you plan to arrive after 6PM Monday - Friday or on weekends. 19. Do you have a no smoking policy? ALL CONDOS ARE NON-SMOKING and this policy will be strictly enforced and there will be additional cleaning charges should it be found that someone has violated the policy. There will be a $100.00 minimum charge for anyone found smoking in a condo. 20. Will my cell phone work at the condo? Cell phone service is somewhat sporadic on the island. Most of our condos have cell phone coverage. VERIZON and/or AT&T seem to have the best overall coverage; but some have limited cell phone service available at all. SPRINT has limited coverage in the area. 21. What grocery stores in the area? There are several grocery stores nearby. Harris Teeter and Publix offer pre-order pickup and delivery services. If you or your guest(s) accidentally leave a personal item at one of our cabins, please contact us ASAP. If we find the item we will make every effort to contact you to make arrangements to return the item(s). Either way we will act as quickly as possible. During our busier seasons this may take up to 14 days to return certain items. If we do not locate the item(s) before you bring it our attention it may be irretrievable. If we are requested to return the item via parcel post USPS, we will return item(s) including packaging for a minimum fee of $10.00. The fee for returned items can be charged to: the credit card on file or another credit card. You may also use other shipping arrangements using a UPS, FedEx, DHL account. Unit Assignments: Amelia Rentals reserves the right to move any reservation to another comparable unit based on unforeseen circumstances. The rental unit may not be sublet or the rental agreement assigned without the written consent of an authorized agent of Amelia Rentals. 24. What is your grilling policy? Play it safe! Please NO gas grills on your balconies. The Florida Fire Prevention Code prohibits any cooking on a balcony of an apartment or condominium. The only exception is for electrical cooking appliances such as electric ranges or electric grills.